I don’t know about you, but I love jewelry! Especially jewelry that you can completely customize to your mood, feelings, and memories! 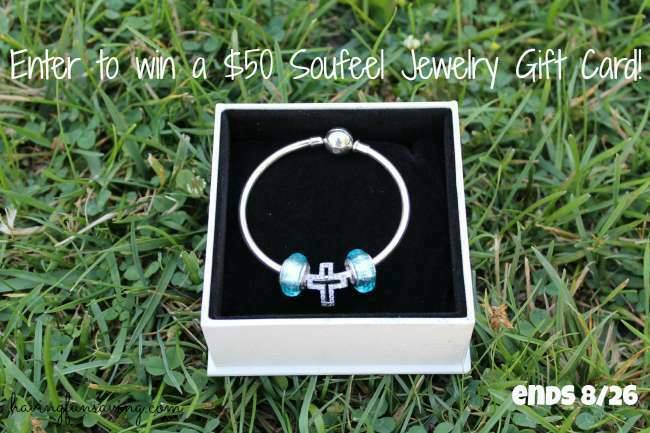 Here is a great chance to win a $50 gift card for your own bracelet. That is what SOUFEEL is all about – celebrating making every day memorable! Today we have a fabulous giveaway where one lucky reader will win a $50 Gift Card! You can get charms (compatible with Pandora), bracelets, necklaces, and more with prices starting at under $10 you are sure to find some pieces that you just love! Be sure to check out Tracy’s Review over at Having Fun Saving. My son’s birthstones would be nice to have. I would like a paintbrush or something to help me remember learning to paint. I would love to save the feeling of being a mother for the first time. I would like to save the memory of when I married my hubby! i would like to save the memory of my daughter who passed away at the age of 15, almost 25 years ago. I think I would like one to remember my brother who passed in January! Thank you! I would like to have one to remember my pets. Likely a memory of my children, those living and those gone on ahead. To celebrate my 2 sons !!!! Would be awesome…. I’d like to remember my daughter’s senior year of high school before she moves on to college and the world outside of our house. I would love to get something to remember my daughter’s skating acheivements. I would love one to remember the birth of my 6 kiddos. MOST DEFINITELY the birth of my daughter! I would love to get one for my two boys! the birth of my daughter….such a special day…. I’d love a reminder of my trip to South Africa last year to meet my husband’s family!